Is your body asking for a re-boot and refresh? Would you like to feel more ease and peace in your life? Do you sometimes eat for emotional reasons? Open to everyone, our Breathe Eat Retreat offers you the chance to centre, connect and to cleanse body and mind in an easy, relaxed and balanced way, leaving you feeling refreshed, energised and inspired. Laughter Yoga - yes, seriously! Inspired by the Buddha's teachings of the Middle Way, the practices and diet we share will be gentle and moderate, making way for easy integration. You will receive a gentle and healthy detox as we share the healing practices of yoga and enjoy balanced cleansing food. 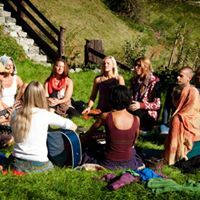 Set at a stunningly beautiful and peaceful natural location, there will be time for silence, sharing and for music. Suitable for both beginners and the more experienced; individual attention will be emphasised. By combining asana practice with meditation, relaxation, conscious cookery, discussions, nutritional guidance, pranayama and chanting, we offer an experience of holistic living. This means developing a fuller and more meaningful connection with our experience, with our bodies, with those around us, and with our purpose and place in the world. The pace of the retreat helps participants to remain energised and engaged throughout. The schedule is designed in such a way as to balance activity with rest, discussions and socialising with quiet, reflective time, and earnest inner exploration with fun and laughter. The retreat experience can be deep and transformational, and we put a lot of care into setting up an environment that is safe, nurturing, friendly, relaxed and supportive. At Holistic Yoga Retreats, we are committed to promoting improved health, wellbeing and understanding, for the benefit of all sentient beings. The food served will be delicious, nutritious and especially suitable for practitioners of yoga and meditation. It will be mostly organic and PEOPLE ON VEGAN AND GLUTEN FREE DIETS ARE MOST WELCOME! The food and practices will offer a gentle and healthy way to detox. 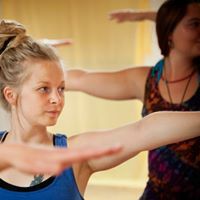 Michelle will offer yoga and meditation based on the traditional Hatha Yoga teachings but taught in a way that is fluid, free and up-to-date taking into account each individual's needs. Ollie will share some of his rich experience from the worlds of Ayurveda and Oriental traditions as well as raw food and other contemporary cuisines. You will be given a booklet full of useful information and vibrant recipes to take home. In the evenings we will enjoy the chance to sing together. With no need for musical ability, singing is a gentle form of exercise - it works the lungs and heart, oxygenates the blood and generates endorphins - happy hormones! I didn’t really know what to expect on retreat and it’s been challenging in different ways but Michelle and Ollie have provided guidance, wisdom, inspiration and laughter and I am taking so many things away from my experience - all of them positive. I’m glad that I have had this time to grow and reflect on what is important. Life matters - everyone should try this! This yoga retreat is so rejuvenating. A perfect mix of silence and tranquillity in the mornings, and uplifting music in the evenings. I especially enjoyed the vigorous chanting and singing, the vibrations lingered on in my body long after. In addition, coming home with practical knowledge and new ideas of how to eat more healthily has vastly improved my way of living. Thank you Michelle and Ollie, you created a really safe and friendly place in which to completely let go.